Stop for a break at Wollomombi Falls picnic area in World Heritage wilderness in New England, for breathtaking scenic views of waterfalls and gorge country. Remember to take your binoculars if you want to birdwatch. If you love the raw power and beauty of rugged wilderness, then a visit to Wollomombi Falls picnic area in New England is your idea of heaven. After heavy rain the waterfall cascades 220m over the dramatic cliffs to the valley below and a great way to introduce the kids to the might of the natural elements. When the force of nature gives way to hunger, unpack the picnic basket and barbecue up a feast under the shade of the red gum and yellow box. If you’re after action, there’s a range of walks that show off the rugged beauty of this beautiful area. And if you'd like to spend more time here you could pitch your tent at Wollomombi campground. 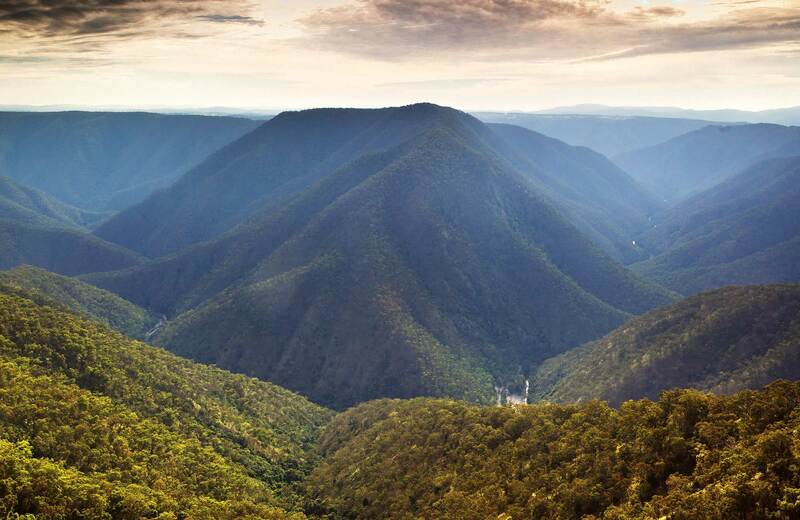 Make your way to the nearby lookout and gaze over the highest waterfall in NSW. If it’s been raining, you’ll soak up more than just the scenic views as the massive gorge fills with mist and the occasional rainbow. If bushwalking is on the agenda you could try Chandler walking track or Wollomombi walking track as both tracks start from the picnic area. Monday to Friday, 8.30am to 5pm. Oxley Wild Rivers National Park is always open but may have to close at times due to poor weather or fire danger. There are 3 areas in Oxley Wild Rivers National Park where you'll need day use vehicle permits: Halls Peak campground and picnic area, Riverside campground and picnic area, and Youdales Hut campground and picnic area. Day use vehicle permits can be bought online or by calling the National Parks Contact Centre on 1300 072 757. If camping, permit fees are included in the campground fee. Contact hours: Monday to Friday, 8.30am to 5pm.